If children grew up in the rainforest, they’d get most of the nutrients for proper growth and development from whole foods like fruits, vegetables, whole grains and fish. Nutrients that are often missing from today’s diets. 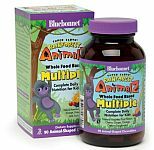 Bluebonnet Super Earth® Rainforest Animal® Whole Food Based Multiple helps bridge this nutrient gap, providing important vitamins, minerals, super fruits and vegetables in two yummy animal-shaped chewables. Natural assorted flavors. Other Ingredients: Natural orange, grape and cherry flavors, EarthSweet® [juice concentrates (wild blueberry, cranberry, prune, cherry, strawberry, grape, raspberry and bilberry fruits, grape seed, raspberry seed), cane crystals], xylitol, citric acid, vegetable magnesium stearate, stearic acid. Free Of: milk, egg, fish, crustacean shellfish, tree nuts, peanuts, wheat, yeast, gluten, barley and sodium. CAUTION: To be chewed only. Not intended to be swallowed whole. Store in a cool, dry place, tightly sealed. WARNING: Accidental overdose of iron-containing products is a leading cause of fatal poisoning in children under 6. Keep this product out of reach.